Superstorm Sandy wreaked havoc along the US east coast in late October causing destruction across its path. Ports up and down the coast suffered varying degrees of damage. Perhaps the worst hit was that of the largest East Coast port and third largest in the US, the Port of New York – New Jersey. The port closed at midnight October 29th but due to electrical problems, wind and flood damage, the port was slow to reopen. Port Elizabeth was the first to reopen on November 4th followed by Port Newark Container Terminal and the Global Terminal in Jersey City on November 5th and by November 6th all terminals had reopened. How much freight was diverted to other ports? According to the port commerce director of the Port Authority of New York – New Jersey, the port did not lose that much business, only about 6,000 containers that were diverted to the Port of Virginia. However, it appears that more containers were actually diverted and to other ports as well. Although closing for a brief time, once reopened, the Port of Virginia did note that it worked two diverted vessels and handled between 5,800 and 6,500 additional containers and 3,500 automobiles bound for the Port of New York-New Jersey. The Port of Halifax also noted that cargo volumes had “tripled” as a result of Hurricane Sandy. Attempts to reach the Port for additional information have not been successful to date. Maersk Lines reworked its east coast route and temporarily shifted containers to Florida’s Port Everglades, Philadelphia and Virginia ports. While still too early to tell what the effects on ports were in regards to diverted containers, Zepol’s October data may provide some insight. 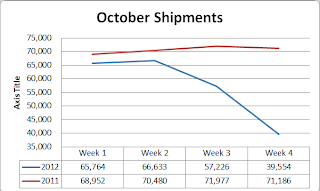 For the month of October, import shipments are down almost 19% compared to October 2011 for US east coast ports. Certainly Superstorm Sandy is not to be blamed for the entire decline as the slowing economy and perhaps an earlier peak may be attributing this decline as well. 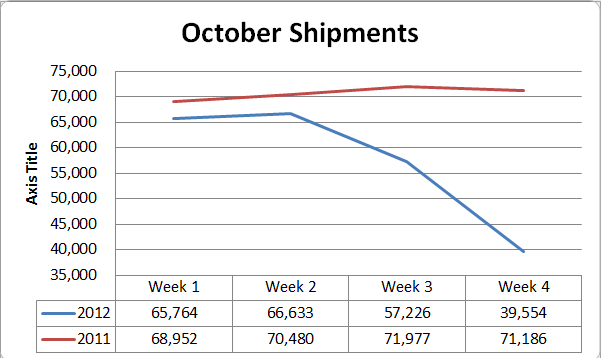 As noted on the chart, a sharp decline in shipments occurred beginning week 3. During this week, Hurricane Sandy had already formed and had hit Jamaica on the 24th and Cuba on the 25th before heading up the US east coast. There may have been some negative effects on the southern east coast ports such as Jacksonville, Savannah and Charleston which could have attributed to the drop in shipments for the third week. For week 4, U.S. imports to the east coast dropped, on average, about 31% from the week prior and 44% from week 4 in 2011. Not surprising compared to same period in 2011, import shipments to the Port of New York – New Jersey declined almost 55% for week 4 and for the month, import shipments declined about 24%. The Port of Philadelphia was also hit hard as import shipments declined over 47% for week 4 and 12.4% for the month. Same case for Baltimore which suffered 30% decline in import shipments for the week the storm hit and for the month of October, a 47.4% decline. November should bring some normalcy back to the ports as many work through backlogs. Permanent diversion of cargo away from particular ports is not anticipated. However, there still remains some road and rail infrastructure damage which may cause slight delays in transport from some of the ports.